VOTE OF US EVERY DAY, BECAUSE EVERY DAY COUNTS! 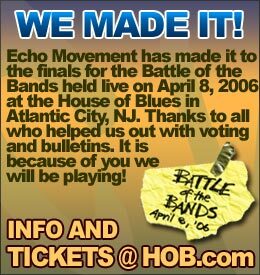 We made it through the first round of elimination and we now need our fan’s help to make it to the finals of the John Lennon Battle of the Bands show at the House of Blues in Atlantic City, NJ. As incentive, we have the first song off our new album coming out this summer. So go to the site to hear “So Hard” and vote for us. And just so you know, YOU CAN VOTE FOR US ONCE A DAY!!! So help us make it to the finals and vote every day until March 20. Echo Movement is an original reggae-rock-dancehall-soca band based out of the New Jersey Shore. Established in the summer of 2004 by brothers Stephen and David Fowler (founders of the cover music trio Indian Summer Band), Echo Movement is quickly gaining respect as a leader in the emerging east coast reggae scene. Visit the website for more info, music, photos, and bios or sign in on the new forum page!